Today, we spent time with staff, students, and families of the Cultural Center of North Batahola, one of the neighborhoods in Nicaragua’s capital city of Managua. After checking out of our hotel and enjoying a delicious breakfast of gallo pinto (a mix of rice and beans), scrambled eggs, fresh fruit, and a cup of coffee (or three), we all piled into the tour van and rode across the city to El Centro Cultural Batahola Norte. As is the Nicaraguan way, we were welcomed in with smiles and friendly greetings. We got to meet high school students who received scholarships to attend the center and receive training and teaching experience. We also tool part in an English class, beauty class, and typing class to get to know the students and took a tour of the center to gain a better understanding of their history, the challenges they have overcome, and the wide variety of programs and classes that are offered at the center. 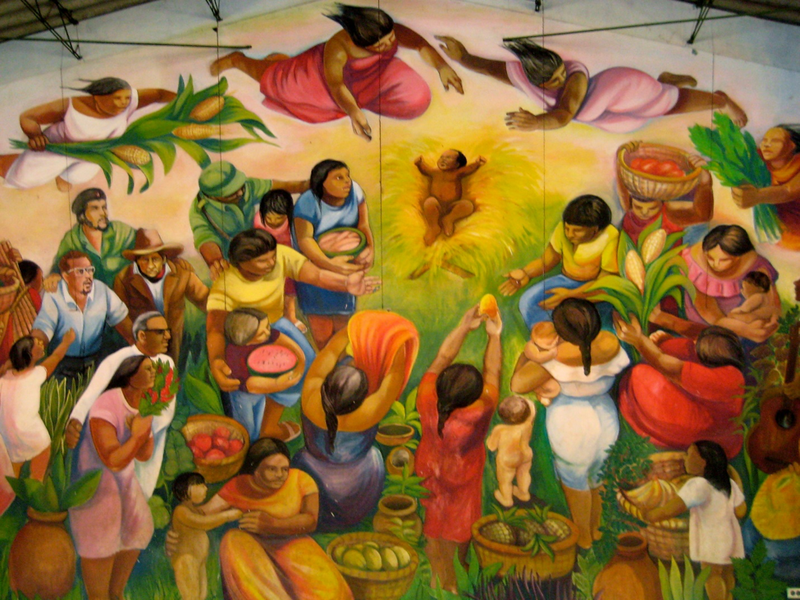 The main focal point of El Centro Cultural Batahola Norte is a mural depicting a Nicaraguan interpretation of the Nativity Scene, with women and children contributing gifts of food local to the area. It also shows four important political figures of Nicaragua’s history: Augusto Cesar Sandino, Carlos Fonseca, Che Guevara, and Ernesto Cardenal. After the tour of the center, we met the families who would host us that night, and we spent the next couple of hours sharing stories over lunch and learning more about their everyday life. I even got to teach my host family how to play Bananagrams, a game that was gifted to them by one of their former students but since the directions were in English, they had never learned how to play. It was a good way to bond and teach each other some words in English and Spanish. After lunch, we returned to the cultural center and spent some time talking with the administrators, three women with different backgrounds and connections to the center, but all with a passion to help others through education, the arts, and by building a community of support. This was one of my favorite parts of the day because it was really inspiring to hear about the impact they are making in the community, especially through gender violence prevention classes. It was encouraging to hear how those women take what they learn at the center and then share it with their neighbors and friends so that little by little, women are standing up for themselves and getting the help and resources they need. The next activity was definitely one of the more engaging and comical activities of the day—learning practically all of the traditional dances of Nicaragua in only 1 hour. Song after song, step after step, we all worked up a sweat while laughing and trying to keep up as best as we could. I think the group favorite was “The Banana”, which may or may not have been the simplest of the 20+ dances we tried to learn.